When I was a newswriter my editor threatened us with bodily harm if we made an error. You’d get fired for misspelling someone’s name. Seems today we are much more cavalier about accuracy and precision. I like to think our writing reflects who we are and how we judge our readers. When I write, for example, I imagine what a reader hears. And I’m flattered when someone takes time to read what I have to say. 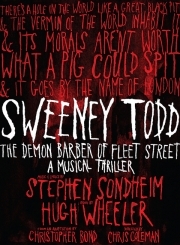 So I was offended—as a reader—when consuming the programme for a local production of Sweeney Todd. The programme—a glossy 4-color booklet about the play and the company–is an extension of the theatre, in this case, Portland Center Stage. The lavish production shows that folks take great care in all sorts of tiny details–ensuring that the lighting reflects the feel of London’s squalor and that blood sputters in just the right color of crimson from the necks of the barber’s victims. But the programme copy is sophomoric and dull. The theatre company needs a good editor. Clearly the cast is thrilled. Too bad the programme—which is a material take-away from the show—reflects poorly on the production so lovingly created. This entry was posted in journalism, writing and tagged rhetoric, stereotypes. Bookmark the permalink. ha ,,almost like corporate life or dare say gov. like,,,,all of the people came to see a play and the progame booklet should be payed for in the production,,soooo,, it should be produced with great care and professionlism unlike my spelling ha ha. i mentioned my brother and sister in law live in portland DR. Sandy Ramirez and Fred..send out an invite to them when you are speaking,,ha ha that would make their day!